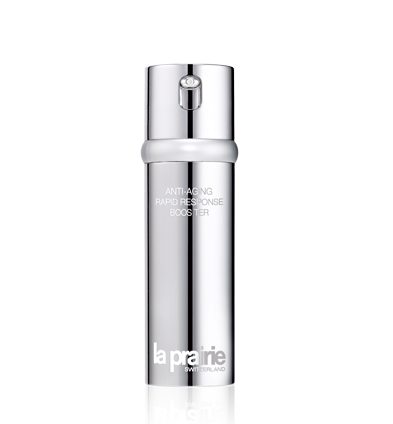 This is what La Prairie claims, “The new Anti-aging Rapid Response Booster has a neuro-calming natural peptide that helps control skin aging, blurring the appearance of deep wrinkles and enhancing the protective barrier of the skin to retain its moisture. In addition, a special plankton extract will exfoliate the surface of the skin and redensify instantly its grain. The botanical brightening complex (a mixture of active ingredients from five different plants) and Silver Vine extract helps the tonicity of the skin. Combined with the exclusive Cellular Complex by La Prairie, this anti-wrinkle care offers an outstanding youth protection to your skin.” This is something major, right? So, I have to try this! The serum has a light pink transparent color, the texture is in a lightweight gel form. Once I apply it to my skin, I can feel that it sinks and absorbs into my skin right away. I guess I can see why it is called “rapid response”, because of the formula is so easy to absorb it allows the product and the ingredients to go deep into my skin. I like it that it doesn’t only address one major issue – anti-aging, but it also helps with brightening my skin tone. As we all know, that wrinkles can’t be removed overnight, nor I expect it to. But what I notice is, how good it made my skin feel, and it is so lightweight and sinks right into my skin. On the wrinkle removing effect? I will have to report back to you ladies again after a week.